All seemed to be said and done, didn't it? Sixteen majors, year-end ATP No. 1 five times, the Career Grand Slam and an Olympic gold (albeit in doubles). That's not just a fine resume, it's arguably (but maybe only just), the best resume in tennis history. That Roger Federer, in lieu of lying on his significant laurels, kept pushing for an ever greater seat on tennis' Mount Olympus is remarkable in and of itself. That's he's succeeded in further distancing himself from the other greatest men of all-time is all but otherworldly, but them's the facts. Now, with the Swiss having amassed his 17th major and his 287th week as World No. 1 as of today, can we once and for all, can we cut the crap and officially start calling Federer the Greatest of All Time (Male Division)? It's ironic that the last ATP World No. 1 was from Serbia, as a spirit of balkanization has engulfed tennis fans in recent years. There's Rafaslavia, over here; Federeriaia over there and a kingdom known as Novak & Djokovicia a little further eastward. Each man's fans...or subjects, to continue the meatphor...often rabidly seeking out ways to prove their man was in fact the greatest. Last year, Djokovic nation surged, as the Serb dominated the most important stretches of the calendar, winning three majors and truly asserting himself in an ATP conversation, where despite having won a major in 2008, he had been more a footnote than a storyline of consequence. While to the delight of the Rafaelites, Nadal proved himself a man for all seasons, having won the career Grand Slam, his (actually) excellent 2011 campaign was obscured by one fact, seven losses to Djokovic on some of the sport's biggest stages (Wimbledon final, US Open final, etc.). It's hard to remember a player who won a major in a given year, looking as downtrodden by the end of it as Nadal did at the end of 2011. 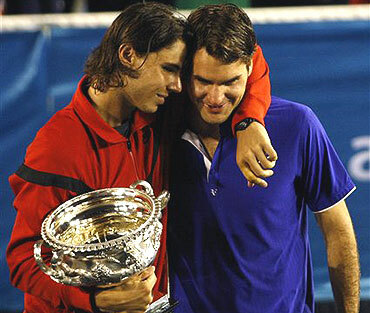 Then there were the Federeriaiains, as their man sank in the rankings, No. 2, No. 3, they waited (impatiently) for their aging king in exile to reassert himself on the throne. Federer, wily veteran that he is, outflanked his foes, sweeping through the autumn season that Djokovic and Nadal largely wrote off, and as a consequence to the No. 1 ranking, two years after last relinquishing it. Federer perfected a strategy roughly laid out in the Nalbandian-Davydenko book and in doing so, found himself on top of the world again. Federer is playing as much for the trophies, the oversized checks and to keep his twins Charlene and Myla entertained as he is for history. 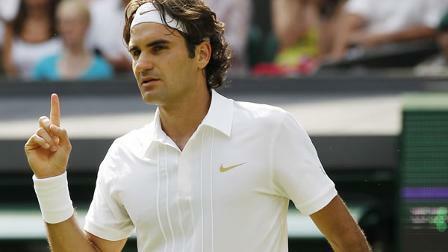 And let's be clear, like Usain Bolt in the 2008 Olympic 100 meter, Federer is far ahead and cruising toward history. Rod Laver has the one feat Federer has yet to attain, the Calendar Year Grand Slam, all four majors in a row within a calendar year. The only players to pull this off in the Open Era have been Laver, Margaret Court and Steffi Graf. Most of the conversation around Laver as the GOAT centers less around the fact that he won the Grand Slam twice (in 1962 and 1969) and more that in the intervening years, as a pre-Open era professional, was not allowed to compete for the sport's four major events. It's an interesting case, but it's largely written within the "Book of If." Looking at the sparkling career Laver actually DID have, 11 majors and two true blue Grand Slams, he's certainly one of the greatest, but we have to remember the Book of If cuts both ways. On one hand, if Laver had played the majors between 1963-1968, he might have amassed up to another twenty majors, rendering this conversation moot. On the other hand, would Laver have seen as much success if some of his competition hadn't gone after the money and turned pro like Laver did after his 1962 season? We don't know and unless we can convince Jerry O'Connell go to a parallel universe where tennis was always open to check the stats, we have to dismiss this case as it calls for rampant speculation. Rafael Nadal, Federer's career rival, is an all-time great too, no question, but unless he makes an all-out assault on the majors in the next two years, it's hard to see the Spaniard getting past 17 majors. If he doesn't, the only way Nadal can seriously contend with Federer in the GOAT sweepstakes is if he can balance his portfolio of majors. Say Nadal finishes his career at 15 majors, and Federer sticks at 17, sorry Mr. Sampras, just go with it...Nadal would need to balance his, let's say eight Roland Garros titles, with maybe three Wimbledons and four split between the hard court majors (or vice versa) to in some sense "match" Federer. That's enough winning on enough surfaces to make the argument, especially given he's beaten Federer in finals at three of the four majors and kept the Swiss from dominating Roland Garros as he had the other major events. Again, Nadal hasn't done that yet and he may not. Check back with us in a few years. Pete Sampras? One word: Paris. All-time great, yes. But GOATs have to find their footing on clay too. Djokovic? He's about a year younger than Nadal, but six majors behind him and twelve behind Federer...read: copious work to do. With his 287th week at No. 1 in the books, Roger Federer has not only put the question of the GOAT to bed (for now), he has done something even more significant. He's given the warring factions of the tennis fan world a reason to cease the skirmishes. Right now, there's no question as to who's the greatest (male) player of all time. So, this promotes intended for bogus low cost extravagance these reproductions usually are just about every rising right now. There are various fake rolex of which begin denoting on-line these wristwatches. In whose sale benefits we have a money connected with simply definable importance from the typically precious metals which might be utilised in fake rolex watches. That has a several important of this convenience, you can aquire breitling replica merchandise including wristwatches, traveling carriers, apparel intended for little selling price. There are various websites of which advertise bogus extravagance wristwatches in addition to gadgets to help persons world-wide. In the event you are looking for choosing a fake rolex for sale, poor quality Panerai check out, you can certainly try to find the item on the net. There are various nation's in addition to overseas websites that include those with bogus extravagance wristwatches on low cost premiums. There are various websites that are online that include most of these fake rolex having opinions connected with imitation wristwatches.